What are the best bookshelves? The best bookcase depends on what you are looking for. Our wide variety of durable designs and styles ranges from classic wooden bookcases to sleek, steel bookshelves. Vibrant Educational Edge bookcases are trimmed in bright colors, well suited for classrooms. Mobile bookcases allow convenient transport of books from room to room, and modular children&apos;s bookcases add charm and flair to preschools and kindergartens. Whether you&apos;re shopping for an executive office or a first-grade classroom, Hertz Furniture has a bookcase to suit your style and budget. The truth is that while choosing bookcases might seem like a no-brainer, it's a subject that actually requires careful thought and planning. Today's school and office bookcases come in a wide range of styles, materials, finishes, sizes – and, of course, prices. What might work in one classroom or office will not necessarily suit the needs of another location in the same school or office complex. So it's worth taking a few minutes to get an overview of your options. What are the benefits of solid wood bookcases? There is no denying that real, solid wood has a beauty and strength all its own. Nothing else quite measures up. The only downside to solid wood is, of course, the price tag. The good news is that since bookcases aren't sat upon, written on, moved frequently or otherwise abused, you don't have to worry that they'll get destroyed if you don't buy the most expensive piece around. Industrial grade particleboard and MDF both work fine for most school and office settings. Just keep in mind that if you have extra-heavy books, the shelves might sag a bit. When it comes to finishes, you've basically got four choices: laminate, high-pressure laminate, veneer and finished wood. The advantage to laminate is that it's inexpensive and easy to maintain. The problem with it is that it can and does chip with time and constant use. If you can find high-pressure laminate, go for it – it is stronger and longer-lasting than standard laminate. Finished wood and wood veneers are beautiful and give a rich look; however, they are more easily scratched and damaged, so if you're purchasing for schools – especially younger grades - you might want to stick with laminates. What style bookshelves should I get? This is the fun part. Be creative. While even the most out-of-the-box among us probably wouldn't choose fire-engine red or sunshine yellow bookcases for a CEO, there's no need to feel that executives have to stick with extra-formal, somber office furniture. Manufacturers like DMI, High Point and Mayline offer quality office bookcases in traditional as well as contemporary styles that maintain dignity with a softer feel. What are the best bookcases for classrooms? The bookcases that encourage your students to read. We want our classrooms to give students a good feeling about school and studying, from preschool on up. At Hertz Furniture, you'll find a great selection of school bookcases, book displays and library corners that help kids want to read. The Educational Edge classroom furniture series offers both wood and steel bookcases in a choice of brilliant classroom colors, for spaces that are beautifully color-coordinated, yet don't distract kids from learning. What size bookcase will fit in my classroom? The bookcase that will fit best in your classroom depends on how many books you have and how big your space is. Keep in mind that bookcases do not necessarily have to be placed against a wall. Many bookcases are finished on both sides so that you can use them as freestanding units or room dividers. Corner units are also a great way to maximize your floor space. Where can I buy affordable bookshelves? 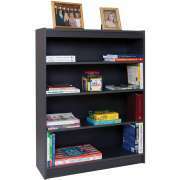 Hertz Furniture has bookshelves at very reasonable prices. We all wish we could afford to purchase the most expensive, highest quality products around. Since so many of our schools and businesses are operating under tight budgets, Hertz Furniture provides a dedicated team of company representatives who will help you research your financing options. Whether you're purchasing bookcases for a single classroom or an entire new library, Hertz Furniture is committed to getting you the best quality furniture while keeping you within budget.